Quarter the tomatoes and remove their tough white core before slicing each quarter into thin wedges. Mix the tomato wedges with the cucumber, onion and pepper and season very lightly before gently tossing in olive oil to taste. Divide the salad between four serving plates or bowls, and add the Feta, arranging all the ingredients carefully. Season with some dried oregano and add the black olives. Finally, drizzle a little more olive oil over the salad and serve straight away, as a starter or side dish. 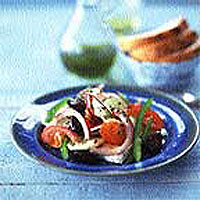 This recipe was first published in April 2003.